Forum Index > Off-topic Talk > Scabbard and grip color matching. Posted: Thu 25 Jan, 2007 4:14 pm Post subject: Scabbard and grip color matching. I know that his is kind of an odd question, here goes though. In the opinion of my fellow forumites, would it look strange for a sword's grip to be one color and the scabbard leather another? With some of the swords I see coming out of shops both are a close color match. Is this historic or just something that is done so it looks good? I ask because I am looking to send in my first order to Christian Fletcher and am debating what color to make the scabbard. I would guess that while a well made and maintained sword could last a while the scabbard would tend to get beaten up and thus need to be replaced more often. Thus causing the colors to be different after a scabbard replacement. Or am I just crazy and stressing over something that is no big deal. Thoughts and opnions most welcome. So please sound off. I think you would be OK as long as the colors compliment each other. From what period is the sword from and what type of sword belt will you have? If you have a look through the plates in the famous 13th century Maciejowski Bible you will see a number of sword hilts which do not match their scabbards. One possibility is if you are getting a suspension system with it, you could have the grip color match the sword belt and have the scabbard in a contrasting color. Considering that a sword's grip and scabbard may have both been changed several times during a sword's working life, it is quite possible (and even likely) that you would get different colour combinations. Also, the grips could be wrapped in bright colours, like yellow silk cord, that may not be used on the scabbard. And the grip could just be decorated in a different way than the scabbard. For instance, the sword from the tomb of Sancho IV (el Bravo) of Castille, circa 1295, has a grip of dark red-brown wood with three inset glass circles painted with the arms of Castile quartered with Leon, flanked by smaller panels of chequy or and sable. The scabbard is covered in rose-coloured leather, the belt is of green galoon trimmed with narrow borders of red silk. The grip on the sword of Fernando de la cerda of Castile, circa 1270, is covered in an elaborately knotted binding of yellow silk cord with an overbinding of thicker red silk cord. The scabbard is covered in a dark brown (?) leather, with an undyed buckskin belt. The grip on the sword of Don Juan, el de Tarifa, circa 1319, has a grip covered in twisted silver wire. The scabbard is covered in red velvet, and the lockets are silver gilt. The sword found in the coffin of Can Grande della Scala, circa 1329, has a grip bound with silver wire and an overbinding of green silk cord. The scabbard is covered in red velvet with silver lockets. These examples show that sword grips didn't have to match the scabbard. Of course, there are also examples in period art where the grip and scabbard do match. I personally don't think mismatched grips and scabbards would look strange, since they occurred historically. It's really up to personal preference. "I'm going to do what the warriors of old did! I'm going to recite poetry!" Thank you all for the responses. Especially Richard for the historic examples. That is exactly what I am looking for. Shae, no offense intended. The words contrasting colors makes me start to go off into lala land. No idea what it is and no care to find out either. Next thing you know you are going to tell me that there are more than 8 colors out there as well. Through Christian Fletcher I ordered a Regent with an oxblood grip, mated to a black scabbard which suits it fine. Then again, it's black— can't really mess up matching something up with black. And lookie there: blackened hilt, polished chape. Contrasting colors. Now that looks sharp. I think that might be the route I end up going. I was origianlly going to go with a hunter green grip and brown scabbard. Now I am going to go with a black scabbard. Thank you for posting that! I agree that different complementary colors can look great together, especially with an integral belt. This picture is of Patrick Kelly's Peter Johnsson Type X with a chocolate brown scabbard. 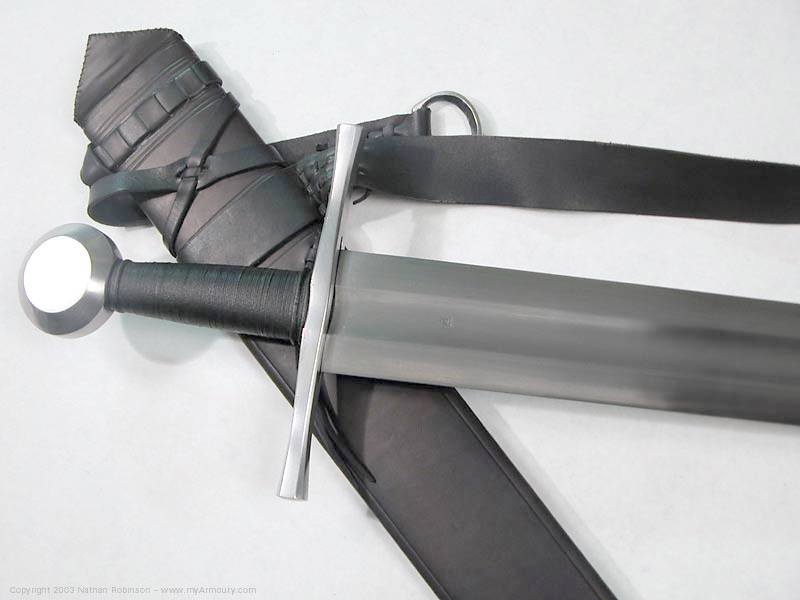 The sword grip is black, and together with the integral belt I think it makes a beautifully classy package. Green, black and silver (steel) is one of my favorite color combinations to furnish a sword. I'm just in my "red" phase at the moment. The medieval mind wasn't hung up on color coordination like we are. The more color and the greater the variety the better. I've gotten to the point where I find scabbards and grips that exactly match to be rather boring. Different shades of the same color, or contrasting colors are nice. In my opinion, that choice should be made in reference to other things: what is it you're trying to represent with the ensemble? Are the sword and scabbard part of a larger kit and as such should fit that particular persona? I definitely agree with Patrick here. Medieval warriors seemed to has a penchant for decorating their arms and armour with colour combinations and choices that might seem gaudy or clashing to the modern eye. Sometimes it seems "the brighter the better", whether it be a sword grip wrapped with a red leather, or a breastplate covered with red velvet. Some grips had colour combinations that might seem to much to the minimalist modern eye. I wonder how common matching grips and scabbard were in period. There seem to be plenty that didn't match. Perhaps you should study some period art and surviving examples, and base your decision on what looks possible, and what looks nice to you. There is no reason to restrict yourself to matching the grip to the scabbard. In fact, there are compelling reasons not to! Hmmm. That sounds familiar. I have decided to go with an antiqued green grip and plain black scabbard for this project. The fittings of the blade will also be antiqued by CF. I cannot wait to see how it turns out. By chance T.L., you would not happen to have pictures of any of your green, black, and silver blades to post would you? I have black and polished steel, in the form of a Christian Fletcher 16th century reitschwert guard to an AT1548 Mk.I, but I haven't quite gotten around to adding the punches of green that I would like (would involve a little sewing). I have an excess of rough green silk that I intend to use for a knot or a wrap to either the hilt or scabbard/bladric for color. The Black Prince's scabbard has traces of red pigment (not red dye). A number of knife sheaths published in Knives and Scabbards show evidence of pigments rather than dye. To concur with Chad, certainly. There are many examples historically, however they tend not to sell as well in todays market. That's why you see so few scabbards with paint in reproductions today. Unfortunately modern people tend to equate brown with old. Even well studied individuals tend to go for a "rustic" look, period pieces often look garish to our modern eye. Many scabbards, sword hilt fittings, armour, knife handles, etc. show evidence of pigment or enamel. P.s. If anyone is interested here is a nice article on period leather working.